I have two stamps set and coordinating dies that I designed that are included in this release, and I wanted to use the stamps today. 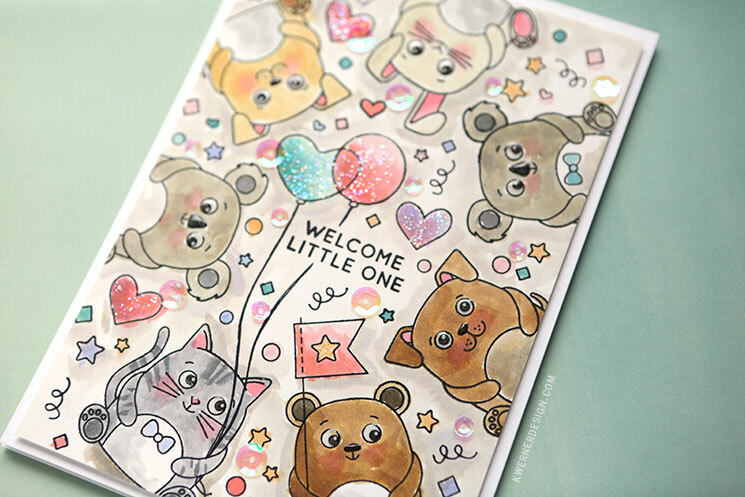 I created a baby card using Cuddly Critters and Cuddly Critters Accessories stamp sets, and this card is a party! Lots of stamping with a bit of simple watercoloring. I stamped the cute critters in Versafine Onyx Black ink on Arches Hot Press watercolor paper, and then watercolored them using Distress Inks. 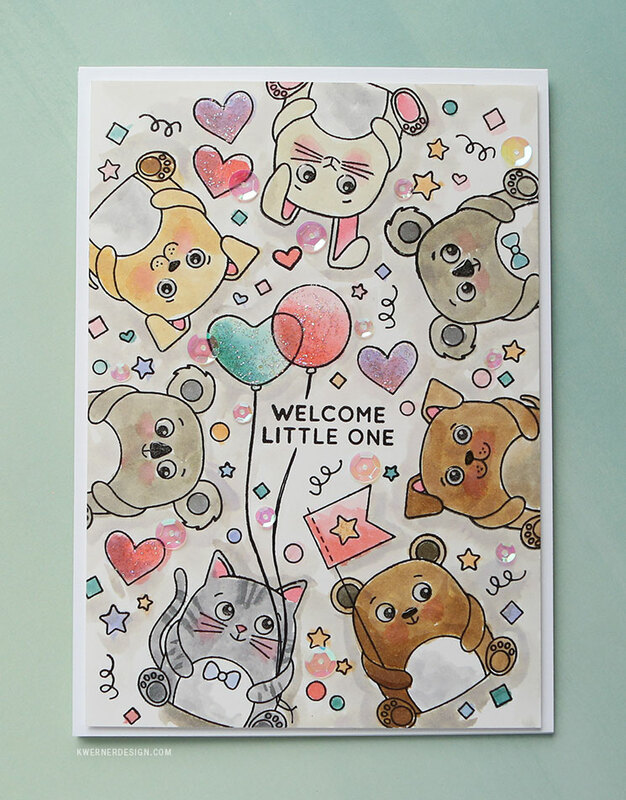 For this card, I did very simple watercoloring, nothing too fussy. I mostly only used one color per area, instead of shading the animals. 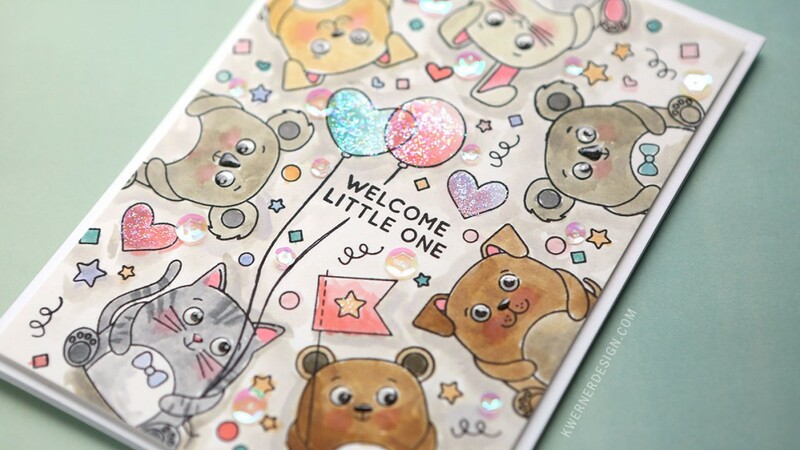 To finish off the card, I added Star Dust Stickles, Glossy Accents on the animals’ eyes and noses, and sequins from Darice (8mm and 5mm Crystal sequins–my favorite sequins ever!). If you’d like to check out the rest of Simon’s My Favorite release, click HERE. Today’s post is part of a blog hop celebrating the new release! Simon is giving away a goodie bag at each stop of the hop. So be sure to comment on every blog to increase your chances to win. 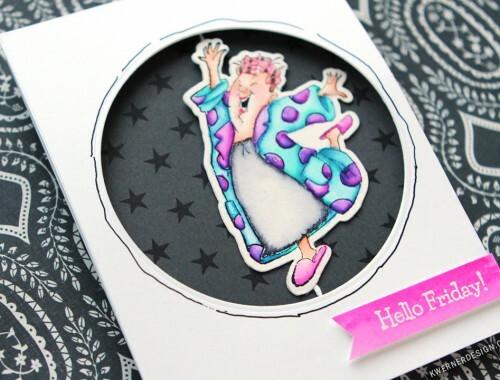 The winners will be announced on the Simon Says Stamp Blog on Monday, March 25. Good luck! You’re next stop on the hop is the lovely Jennifer McGuire. :) Happy hopping! 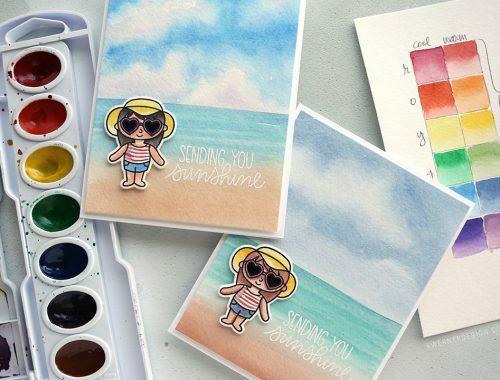 Zig Clean Color Real Brush Markers & Art Impressions Spinner Card + GIVEAWAY!